Are you ready to discover a form of fitness that's so much fun you might have to force yourself NOT to do it? ...an activity that you'll enjoy long enough to actually see results? ...one that requires only one simple piece of equipment, but that offers endless variations and challenges so you'll never get bored? 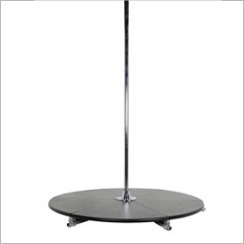 Unless you've been hiding under a treadmill lately, you've probably heard about pole dancing by now. Thanks to Oprah, Ellen DeGeneres, and other high-profile celebrities who have experienced the "power of the pole," the sport has evolved rapidly over the past few years. No longer associated only with strip clubs, pole dancing is now recognized as a sport in its own right...and a pretty amazing workout! In fact, it's become a very popular way to get in top shape. The truth is, a dance pole is a vertical home gym if you know how to use it. Although I'm now retired from teaching dance, fitness, and pole classes, I still love keeping up with the amazing transformations happening in the pole fitness arena. There are plenty of awesome dancers, teachers, products, ideas and just so much fun stuff going on, and I want to help YOU get involved. Whether you're a curious bystander, just starting classes, an enthusiastic student, or a teacher/studio owner, Your Pole Pal (that's me!) is ready and willing to help you along on your adventure. Resources, tips, useful products, even help finding classes in your area or preparing for your first competition - you name it, I'll do my best to help. And if you ever have a pole-related question, just ask! I'm here to help you get the most out of your pole dancing adventure, wherever it may take you. Ready to start exploring? Let's go! Whether you want to learn dance moves and tricks, or you're looking for specific exercises and fitness benefits, you'll find lots of great information in this section. Search the worldwide directory to find a teacher or a studio near you, find out how to plan a great pole dancing party, and get all your pole fitness questions answered. That's why I'll also introduce you to some of the necessities (and nice-to-have-ities) of the sport. Learn about the best dance poles, the newest DVDs, and find out whether or not you really need those 6" platform shoes! And there's so much more to discover inside! I'm always adding new information, and I love getting your questions and requests so I can make this site more useful to YOU! the power of the pole!